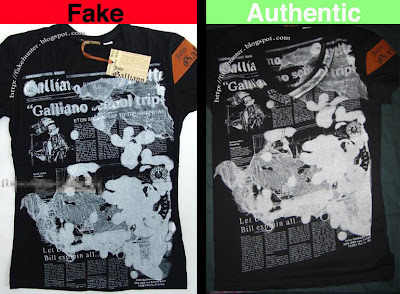 The print quality is one of the best ways to check authenticity with these Galliano shirts. The fake prints have harsher colors, sharper edges, and less subtleties. The fake prints do range in quality but none of them are as good as you real things. The comparison photo above shows the fake and the authentic version of the same print. The difference in print quality is pretty apparent, especially with the head of the figure. You can also notice that a lot of the subtlety is lost in the fake (note the background colors and the black vs. gray skull). Lastly, the fake print stops short of the bottom of the shirt, whereas the authentic print goes all the way to the bottom. That first comparison was pretty easy, but this one is harder. You really have to look at the details of the print. As with the first comparison, the orientation of the print on the shirt is different. You have to zoom in to see the differences in the detailing. 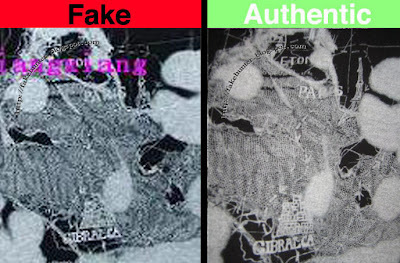 This photo of the fake is pretty grainy, but you can still make out most of the differences. The most noticeable differences are the lettering font and lack of detail in comparison to the authentic print. 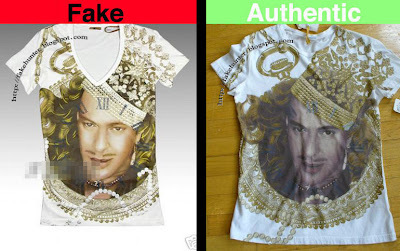 John Galliano makes authentic v-neck AND crew neck shirts, so, don't concern yourself with that detail in this example. What you should be looking at is the print quality, especially in the hair. This fake example is actually one of the better ones. There are some that are much worse, where the shadow of his nose is very dark, with very little subtlety in the print. Enlarge this example to see the differences in the hair. The authentic shirts have raised metallic gold paint in the hair. The fake ones just has printed yellow lines. The fake colors are also much more saturated, and often have a very orange tint to the flesh. 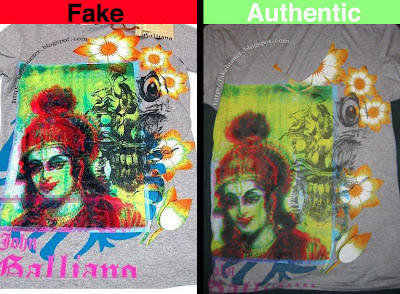 For more real v. fake Galliano T-shirt examples, click the "real v. fake photos" tab under the John Galliano drop-down menu. Or, click here. how come the fakes look better than the original? They don't. The fakes look like crap. 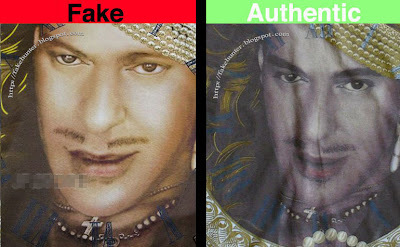 They are done in a very poor print quality and it is obvious when you see someone wearing a fake one on the street.